If you’d love spending some time in a relaxed and calm environment, amidst natural beauty, history and the glitz of the rich-and-famous, then Capri is probably the best place to be. Capri is one of the most beautiful island destinations in Southern Italy, set in the beautiful Bay of Naples, just off the mainland. In ancient times, it used to be a favorite spot for Roman emperors and aristocrats to spend holidays and vacations. They all had villas and palaces on this lovely island. Ever since, Capri has remained a favored tourist destination for Italians and non-Italians alike. I Faraglioni di Capri are among the most iconic sites of the island. Stella is the largest rock measuring 109 meters in height. The other two, the Faraglione di Mezzo and Scolopo measure 81 and 104 meters respectively. The Faraglioni are home to some of the rarest animal species of the area above all, Capri’s blue tinted lizards. The Blue Grotto is known worldwide for its majestic size and its amazing, deep blue waters reflecting the sun to create an amazing silvery light. This wonderful grotto is about 50 meters long and over 30 meters wide and can be reached either by bus or taxi from Anacapri or by boat from Marina Grande. This is definitely a must see in Capri, make sure not to miss it! Nature is, indeed, the best architect, as the Capri’s Natural Arch seems to testify. A true work of nature only, this Natural Arch can be found some 30 minutes away from the Capri’s town center, towards the South Eastern side of this island. It is indeed an amazing rock formation, consisting of two pillars measuring about 12 meters wide with a height of 18 meters. 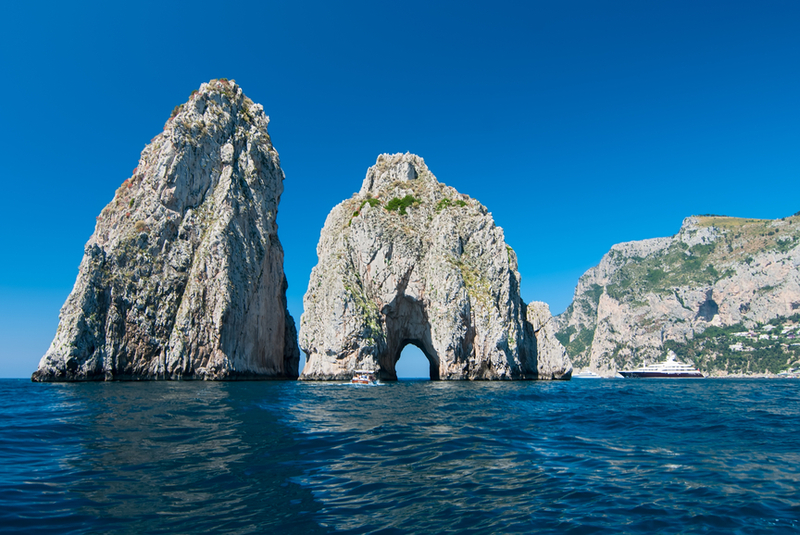 Needless to say, Capri’s Natural Arch is a major tourist attraction, that offers some of the best natural views on the island. On the far southeastern side of the island of Capri, there is a prominent lighthouse erected in 1866. The Lighthouse of Punta Carena is the second most important lighthouse in Italy after, of course, the Lanterna, Genoa’s own lighthouse. Punta Carena is a dreamy location: its beaches are reached through characteristic iron steps leading down beautiful terraces. The sea here is pristine, one of the reason why Punta Carena is among the most touristy location in Capri. For this reason, its beach resorts and entertainment facilities are second to none: Punta Carena is the place to be to enjoy your quintessential beach holiday. The Piazzetta is located in the center of the island of Capri and is truly its heart and soul. La Piazzetta, as we call it in Italian, is a symbol of Italy’s real “Dolce Vita,” that of the 1950s and 1960s, depicted so poetically by Federico Fellini in the eponymous film: those were the years when, on La Piazzetta, you could have easily spotted Sofia Loren, Audrey Hepburn and Gregory Peck, or the members of Italy’s old nobility. Today, of course, things are a bit different: VIPs of the 2010s share very little with the talented, iconic artists of times gone. Yet, La Piazzetta has retained its charme: its beautiful location, with views upon the sea and the Monte Solaro, are worth every minute. 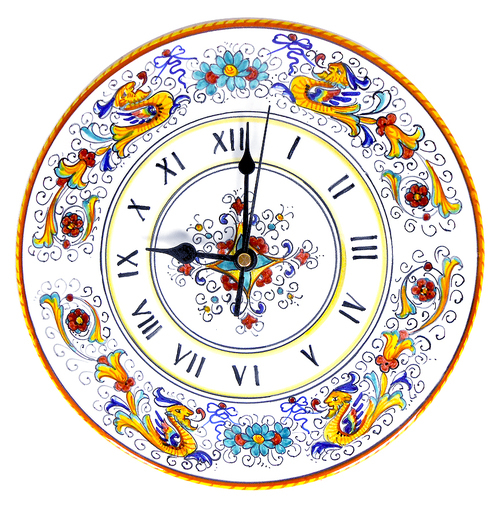 Check out also La Piazzetta’s clock tower, an amazing monument of the island. Capri is an amazing place for foodies. An island in the midst of the Tyrrhenian sea, Capri is an amazing place to try seafood, fish and, of course, pizza. Stuffed Calamari is a typical dish of the area, just as are Ravioli Capresi, pasta parcels stuffed with caciotta cheese and parmigiano, dressed with a marjoram based sauce. 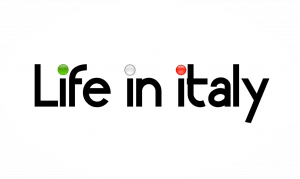 Of course, we cannot forget the ubiquitous Insalata Caprese, that delicious concoction of fresh tomatoes, basil, mozzarella and olive oil, as well as some traditional meat dishes, such as wine marinated wild quail. Want dessert? Try the delicious Torta Caprese, a chocolate and almond sweet treat. There are plenty of ferry services available from Naples and Sorrento to reach the island. In addition, hydrofoils leave from Molo Beverello and Molo Mergellina. These are easily reachable from the Capodichino airport by bus. You can check for departure timings when you arrive at the port to get access to the ferry services for traveling. You may also take a trip to Sorrento as the route is not much longer and there are plenty of ferry services available for daytrippers. If you are planning a trip to Capri, then you can find a wide range of accommodations to suit your budget and preferences. From five star luxury hotels, to hostels you’ll certainly find something to suit both your taste and pockets. You can also consider renting some of the villas available in Capri, if you want to enjoy an extended stay with your family. There are also plenty of Bed & Breakfasts, a friendly and lovely option if you want to spend a bit less, without having to renounce to comfort. If you are traveling as a backpacker alone, then you can also try the camping options using a tent or a caravan. Capri is known as a great shopping hub. Because of its VIP reputation, Capri is full of high end boutiques, just like those you’d find in Rome or Milan. Excellent are also local artisans’ shops producing and selling amazing silks, parfumes and fabrics. In fact, Capri is known for its essences, produced at the Carthusia laboratories, favored by stars such as Madonna, Halle Berry and Naomi Campbell. By Irene Tischenko, edited and updated by Francesca Bezzone.